Our small camping site, which is listed by the Camping and Caravanning Club, provides parking and eco-friendly service facilities for up to five caravans and an adjoining sheltered meadow for up to ten tents. Here you can also stay in one of our two Yurts, the traditional homes built by the nomadic Mongolian tribes. Or choose our self-contained cabin which has a cooker, fridge and shower. Perfect for those who want to get back to nature but with a bit more comfort! 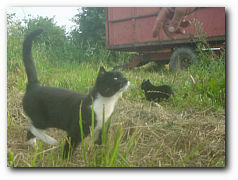 All are situated in a peaceful three acre area of the farm that includes the Barn and Pond field. 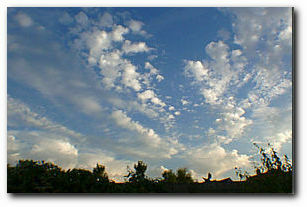 So why not plan to spend a wonderful, eco-friendly, family holiday in the Cambridgeshire fenland countryside. Just imagine how lovely it will be to wake up to wide blue skies and fresh air in the peace of the English Countryside at Karma Farm. < The view of Bank Farm from the hide in the early morning. There's a hide from which to view the bird life on the fenland washes close by which is the ideal place from which to view or photograph them. 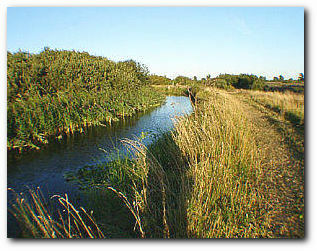 Or you could take a walk by the River Lark along the footpath that leads from Isleham to Prickwillow. There you will find a great variety of interesting and sometime rare, wildlife; fish, birds, insects and other creatures, both feral and domestic. The village of Isleham with it's Shops, Post-Office and Country Inns, is only about a mile away, where a children's playground, bowls club, cricket ground and all weather surface for tennis all add to the fun and facilities available. The 11th century Priory and St Andrews Church are both local buildings of great historic interest and well worth a visit during your holiday. 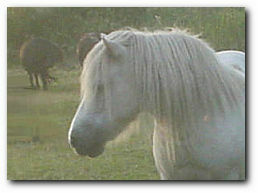 The cathedral city of Ely and the world famous horse racing town of Newmarket, are both only about 9 miles distant. We are sure they will all help to make Karma Farm the ideal holiday destination for you, your family and friends!